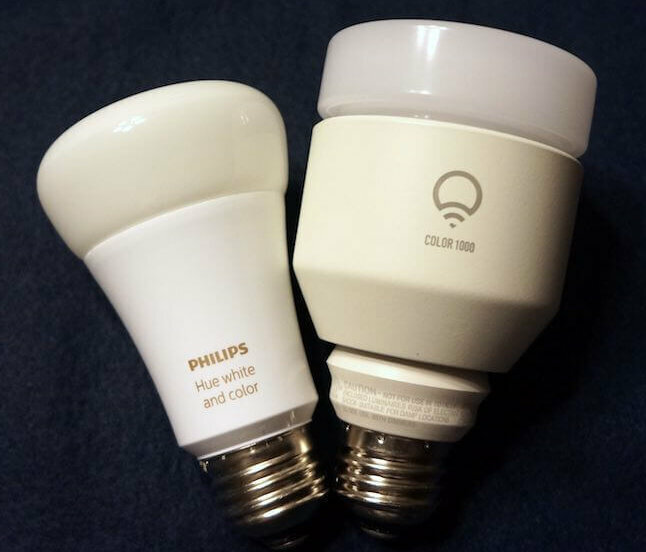 LIFX vs Hue Comparison: which will get you the most bulb for your buck? Smart bulbs are just awesome. They let you automate your home by changing the entire ambiance: for example, have the lights turn blue when it’s raining. Two of the most well-known smart light brands are LIFX and Hue. But how does the comparison LIFX vs Hue stack up? We decided to put it to the test. We spent hours researching and testing both LIFX and Hue Gen 3 so you don’t have to. Here’s what we found. If you’re a visual person, our comparison table above has nearly all of the information you need for LIFX vs Hue, although I’ll expand below. As you can see in the pictures and based on the number of lumens, LIFX is brighter than Hue. This means that the colors in LIFX are more vivid. 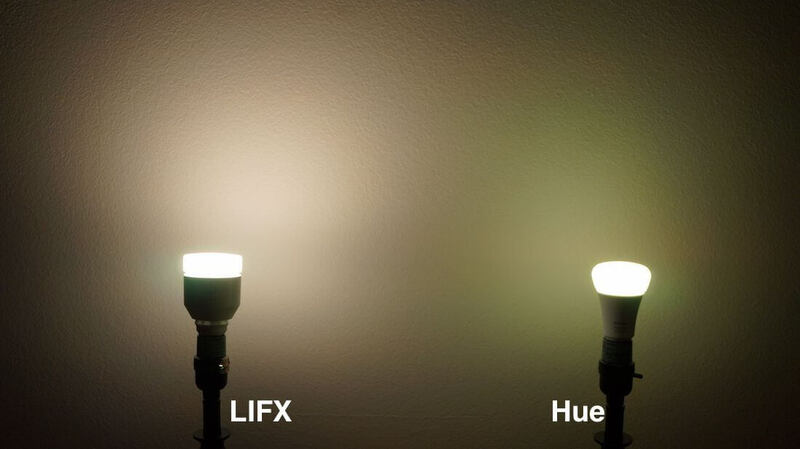 Green appears more yellowish on Hue, especially compared with the neon green offered by LIFX. If vivid, brilliant smart lights are what you’re looking for, LIFX will be the way to go. LIFX just announced that it is now compatible with HomeKit, which is long-awaited news for many Siri fans. If you currently own LIFX bulbs, you can run a firmware update to get them working with HomeKit. 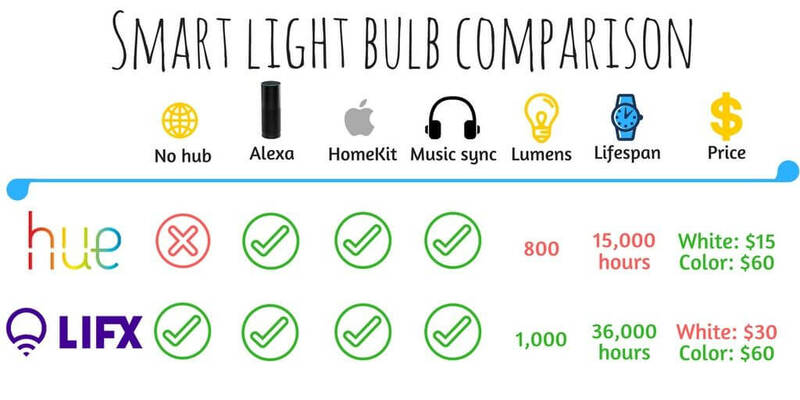 This makes the category nearly an exact tie, since both brands of bulbs are compatible with almost the exact same home gadgets. The only difference for compatibility between LIFX vs Hue is with Wink, and if you are a Wink hub user, then you will want to purchase the Hue system. 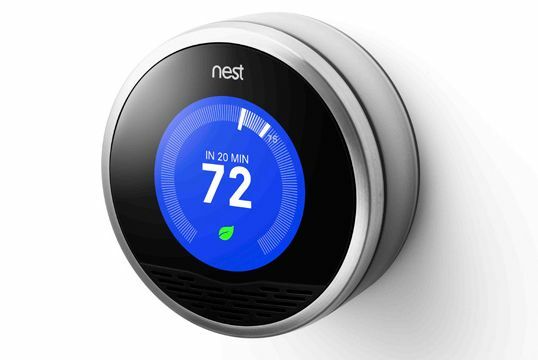 Otherwise, consider this category is a tie since both bulbs are so well connected to other smart home technology. 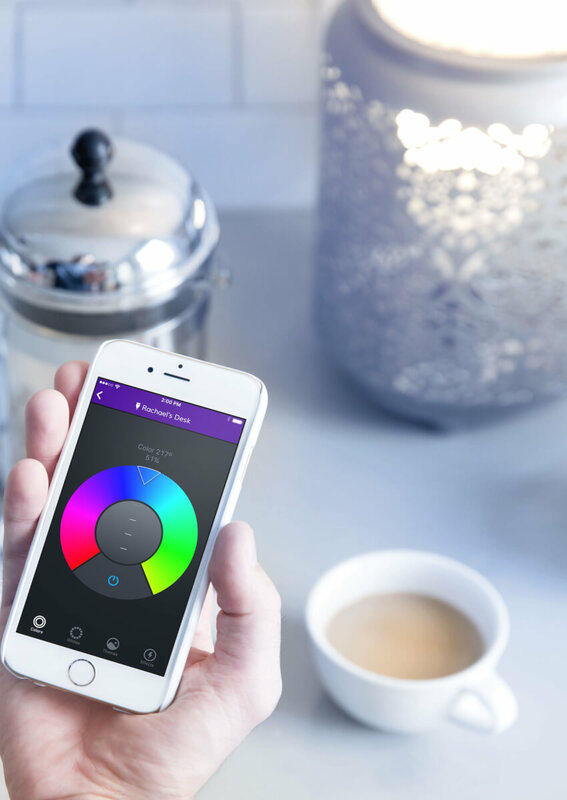 The LIFX app is more simple and easy to use, while the Philips Hue app is a little more complicated. LIFX has some skilled designers who worked hard to keep the app simple, and it is. 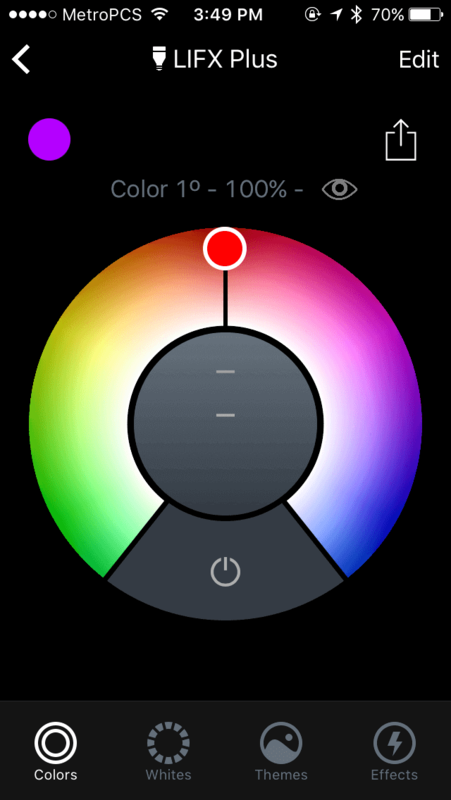 You can simply turn the color wheel to watch the light change, or move the slider in the middle up and down to adjust brightness. While it might occasionally drop connectivity for some users, we have mostly had success using LIFX in our home for a few years. As always, results vary depending on your Internet. If LIFX doesn’t connect to your Internet well, you can always return it and try Hue instead. Hue takes a little more getting used to and is harder to control. You basically move the pointer around on the color screen, then click done. Change the brightness on the screen listing all lights. This can make it difficult to find the exact color you’re looking for since you need to go back and forth between the color picker and the brightness slider. I also had it crash on me a few times, which never happened with LIFX. Both brands have bulbs for ambiance lighting. For example, the LIFX white light is adjustable over 1,000 whites. You know how shades of white can vary from a yellowish, to a blue, to everything in between? Both Hue and LIFX have bulbs that let you customize the color of your white light to match the room that it’s in; they recommend warmer whites in the living room and bedroom, and cooler whites in the kitchen and hallway. 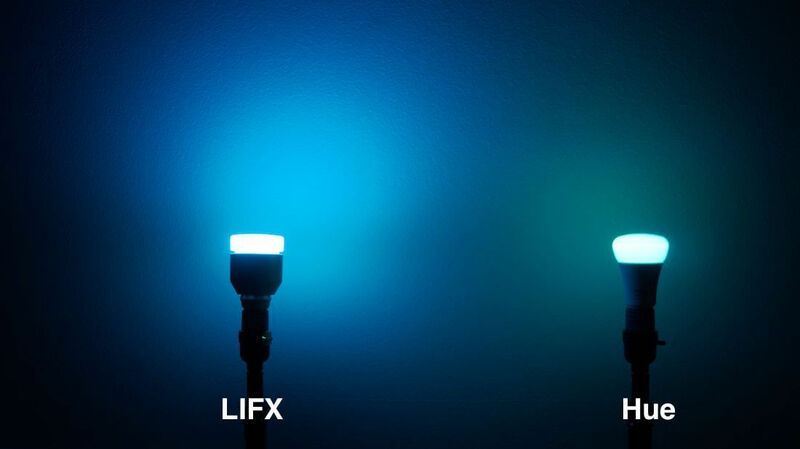 LIFX offers more standard light bulbs in different sizes. It seems like the LIFX business model is to sell less products that are very high quality. LIFX’s counter argument to the different lighting options offered by Hue is that you can just put a LIFX bulb into a cool lamp to make it smart. Of course, that adds to your cost, and you have to make sure the bulbs fit (especially since LIFX is a little wider than generic bulbs). 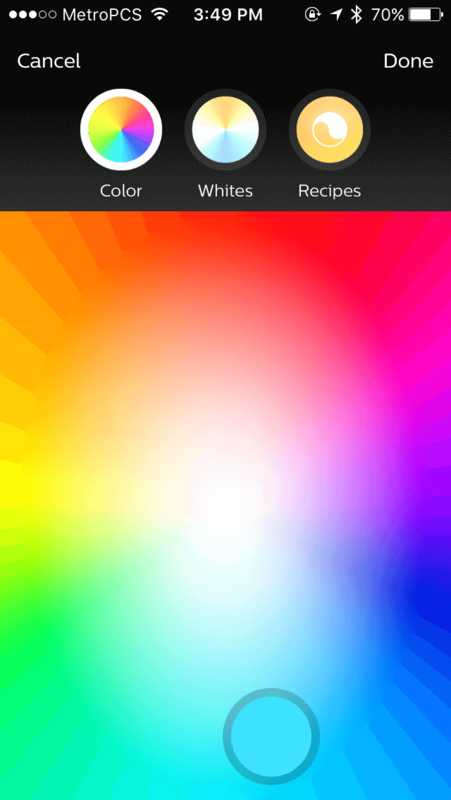 At the end of the day, it still has less options than Hue, but that is changing. LIFX recently added LIFX Z light strips, LIFX Mini, and LIFX Plus bulb, which lets off infrared light to help security cameras expand their field of view at night. 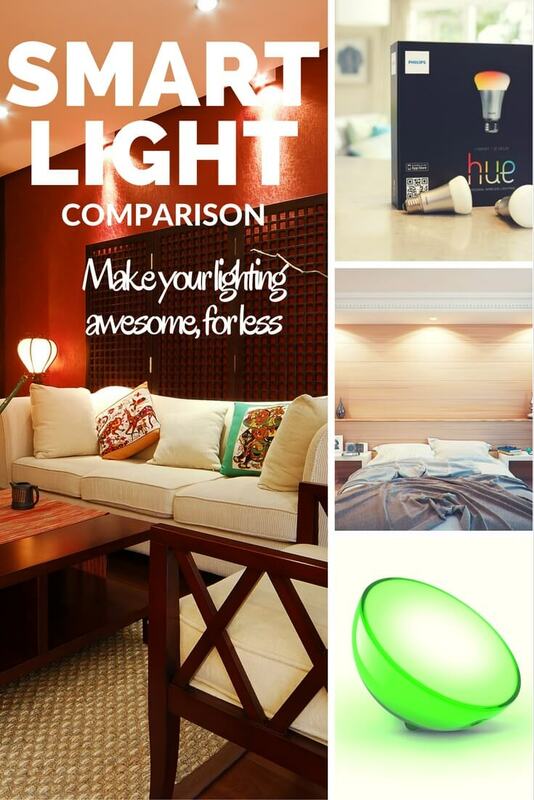 Hue’s other options are equally impressive, with ambient lamps that can really change the vibe of your home. 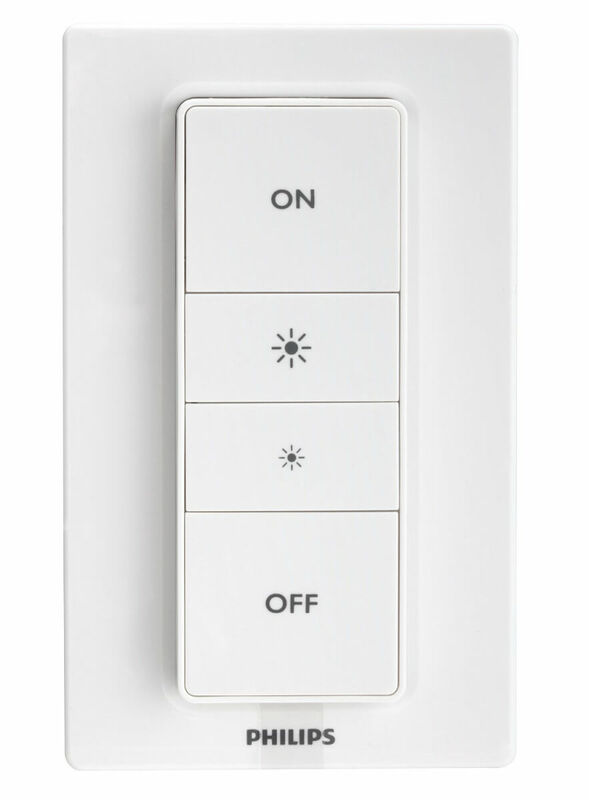 They also offer several varieties of light switches and remotes for those who want to replace physical switches in their home. 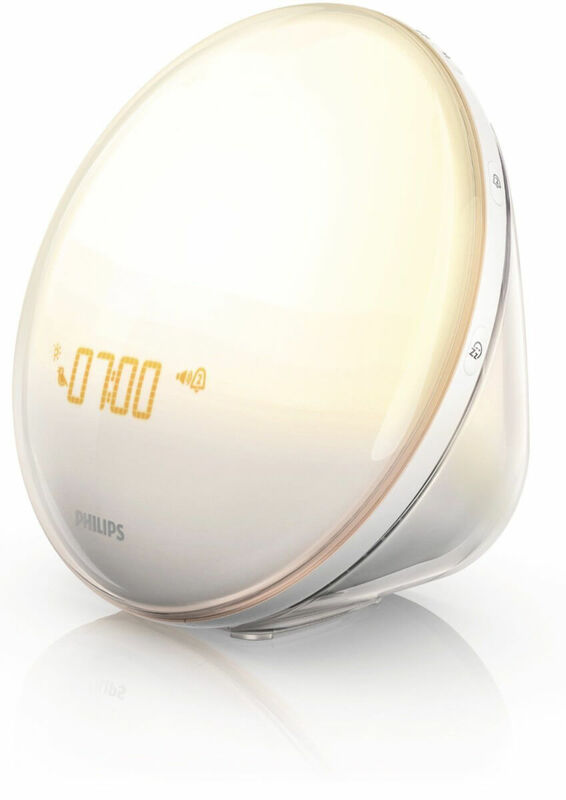 Hue’s morning wake-up light simulates sunrise and dusk to help you fully wake up and feel rejuvenated. 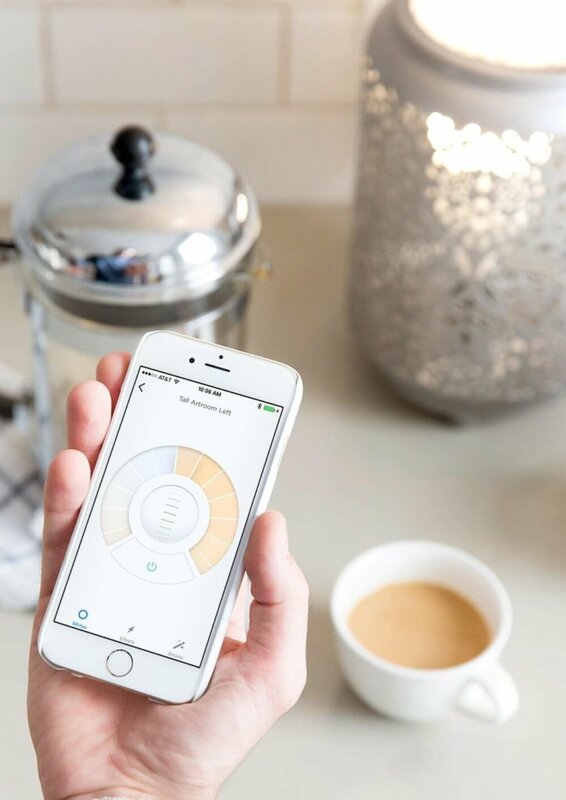 While LIFX is growing its list of smart lighting options, Hue is still ahead of the pack with wall switches and lamps for a whole-home system that works within the Philips Hue app. LIFX is catching up quickly, but in the meantime Hue wins this category when comparing LIFX vs Hue. No hub required. Simply screw in the bulbs, download the app, and go. Hub required; you can’t control bulbs in the app without one. While this brings more automation options, it’s an extra cost. 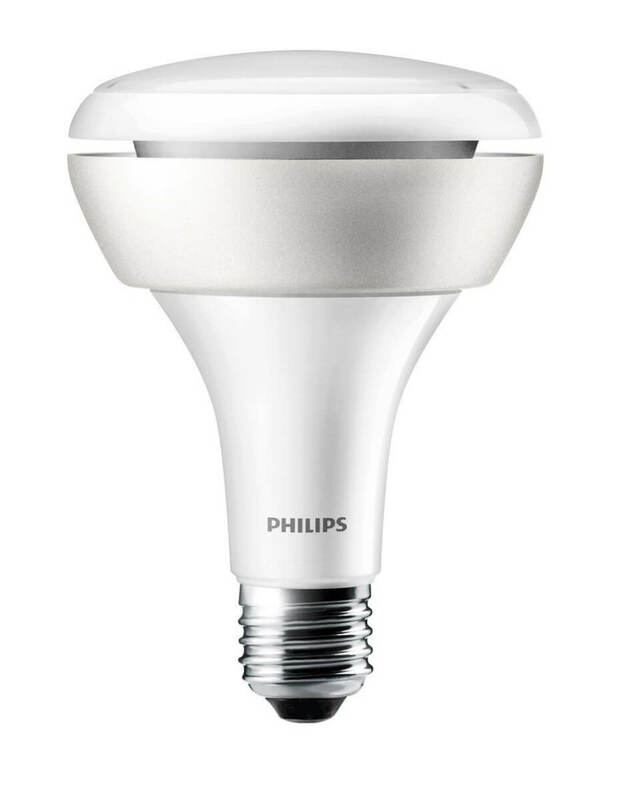 LIFX requires no hub, which I consider to be a plus over Philips Hue. In my comparison table above, I listed the fact that Philips Hue requires a hub as a negative factor, although some may disagree. There are certainly pros and cons to getting a hub. 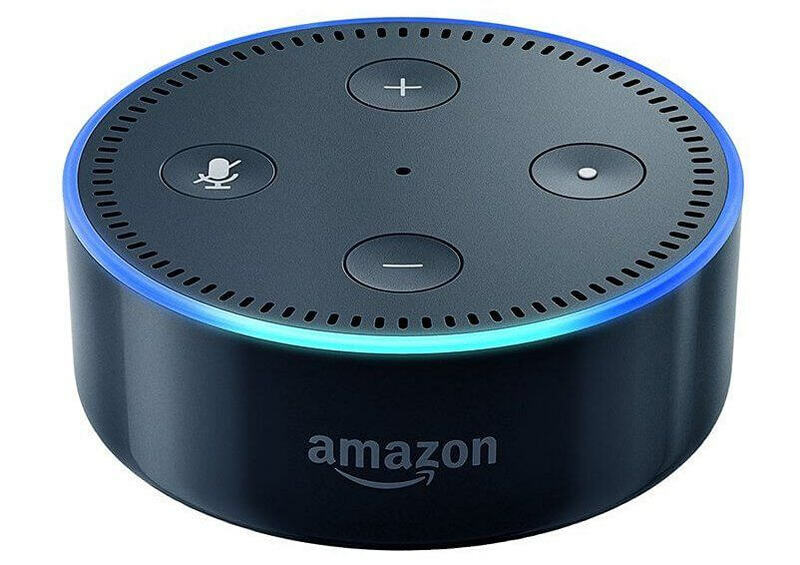 Pro: The positive spin on a hub is that it means your home can be smarter and communicate with other devices. 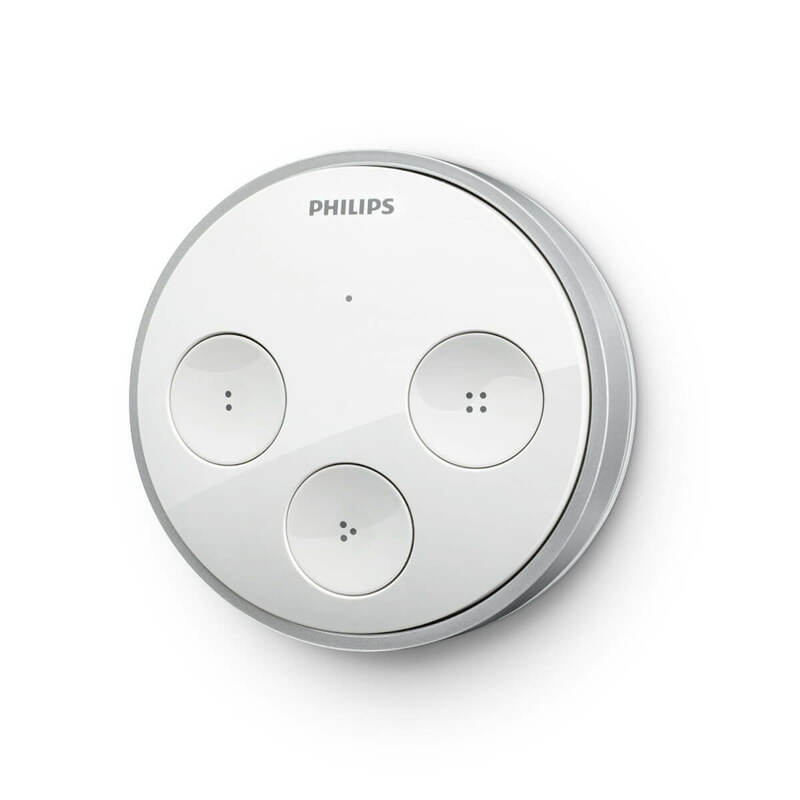 The Philips Hue hub (they call it a bridge, but don’t let that confuse you) is Zigbee compatible, which means you can use other Zigbee bulbs within your Hue smart light set up to keep your costs low. Con: The negative is that the hub usually runs around $60, which is obviously a financial obligation and makes you feel a little more “locked in” to the brand. It’s also one more thing to plug into your router, which, if you’re like me, is already a chaotic jumble of cords. 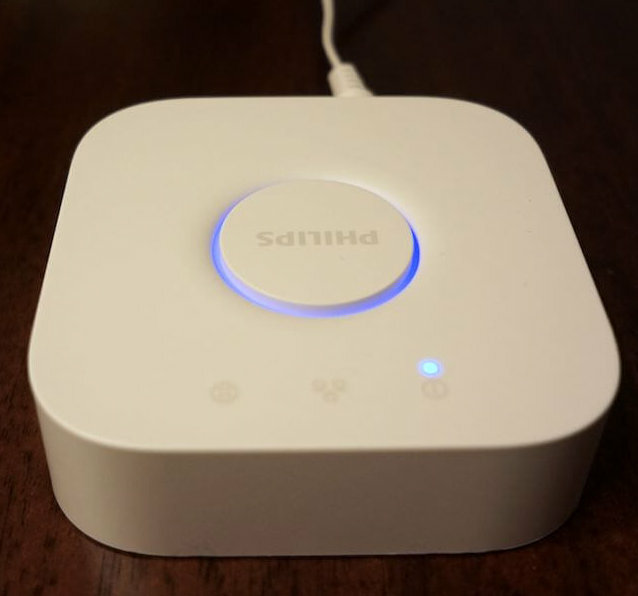 The argument for the Hue hub is that eventually its integration can grow as you add Zigbee compatible door sensors or security cameras. This way, if a door opens or a camera detects motion, it can trigger the lights to turn on. This is convenient for you, and more secure since a burglar will think someone is home. Of course, this type of integration is also possible with LIFX since it works with the SmartThings hub. Long story short: If you don’t mind buying and plugging in the hub, then Hue should be no problem. But if you don’t want to deal with a hub, then LIFX is the way to go since it doesn’t require a hub at all. The overall winner is… LIFX! In my testing, LIFX color bulbs have been easy to use, very bright, and a hit whenever we throw parties. The bright colors and hub-less technology are what pulled me in, and I haven’t been disappointed. The white bulbs are pricey, but I saw one on sale at Lowe’s a few weeks ago for just $20. I own LIFX Plus, LIFX, and LIFX Z strips. Connectivity issues are rare and next to none. 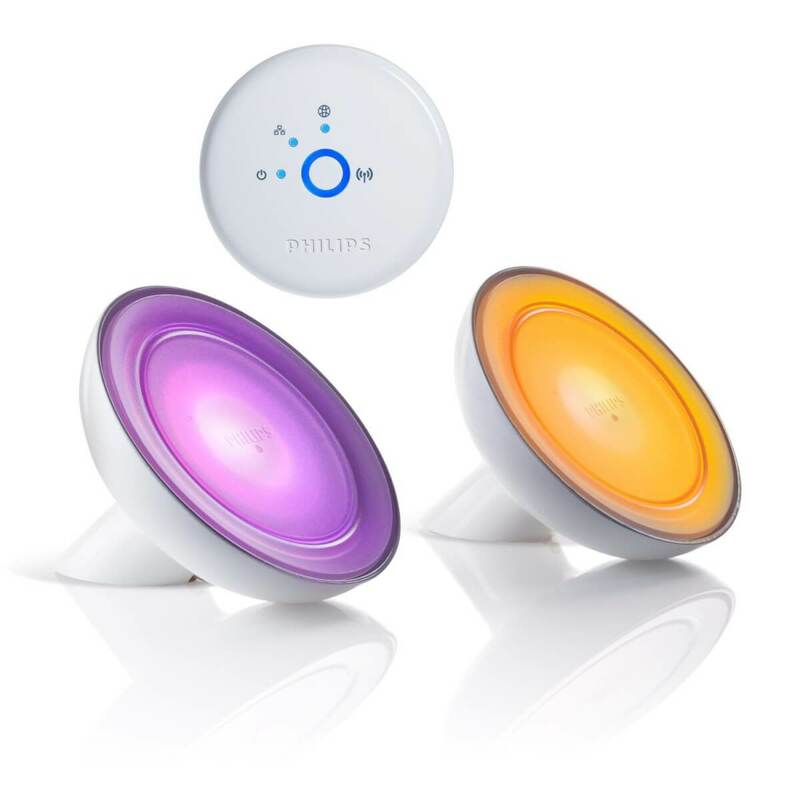 The devices work very well and are extremely bright and colorful. I consider one less hub plugged into my router to be a big benefit, especially since LIFX works with SmartThings. If I want to integrate a hub, I can use SmartThings to connect dozens of smart home devices to my LIFX lights. All that being said, it’s really difficult to choose a clear-cut winner between LIFX vs Hue Gen 3. Both are the two highest rated light bulbs on Amazon. Their apps, bulbs, and pricing are all highly comparable. 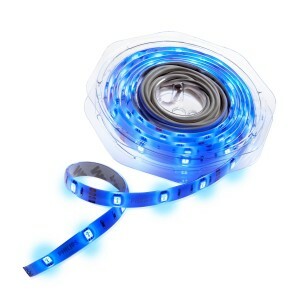 But they are still different smart lighting systems that have their own strong pros and cons. You want to try out one or two smart bulbs or are obsessed with having the brightest, most colorful smart bulbs around. 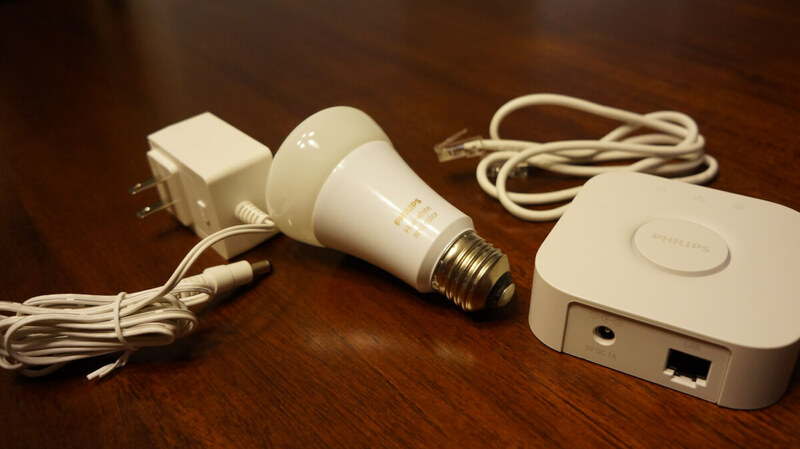 You’d rather buy a set of bulbs and have diverse smart lighting in your home. What do you think? Would you rather install LIFX or Hue Gen 3 in your smart home? To see further smart light comparison, check out our Best Smart Lights 2017 article. Editor’s Note: We originally published this in May 2017. Our writers updated it to stay current and accurate. The Music Sync category lists both as OK, but music sync on the LIFX is completely random and not actually in sync with anything. If you just let it run in silence, it will flash chaotically – see the video I linked. LIFX is aware of this, and I don’t understand why they even offer the feature in the Android app. After having both for the last year, I am currently replacing all my lifx bulbs with hue ones. The main reason being reliability. I have never once had a problem with the hue bulbs, whereas the lifx bulbs seem to require constant attention to keep them from going offline, which can on occasion mean a full reset to resolve. The lifx bulbs are brighter, go dimmer, have a wider range of colours, but they are just not reliable. This is a good point. LIFX connectivity is mostly reliable for me (with a few dropped connections here and there), but I have heard about this issue from other readers and on Amazon reviews. I will have to edit the article to include connectivity as a factor between LIFX vs Hue. looking forward for your edited article before taking the plunge into either! Updated. It didn’t effect our overall winner in the long run, but we added a quick paragraph about it. Since there are so many variables when it comes to Internet speeds and connection, we just included it as a factor to consider in the App and Software section. I have two second gen Lifx bulbs as I wanted to start out. The brightness is great, as well as the interface, but I’m disappointed that I will have to buy 3rd gen for Homekit. Plus the lack of switches is somewhat irritating, and usually rely on IFTT to trigger off when I leave. And I would have it set to trigger on when I get home, but I don’t want them coming on in the day, and I’m not versed enough to make a new rule for that. I don’t mind the hub (I have plenty of router space) But the physical switch options are nice. I have a friend who has hue and I’m somewhat envious. I had difficulty with LIFX at first, until I changed my home wifi router setup. 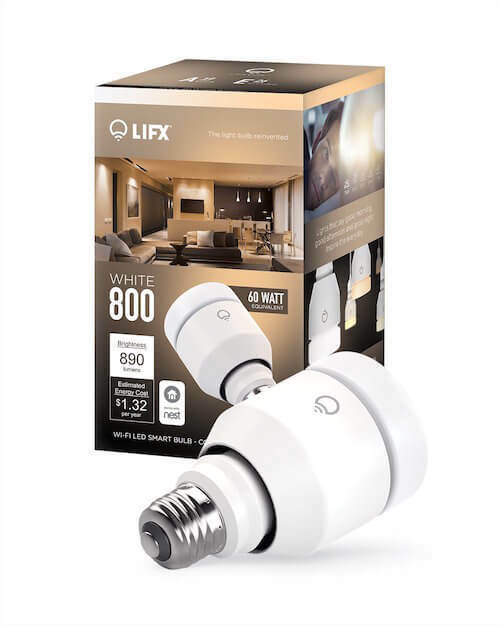 I’ve found though that with a strong wifi connection (and it has to be strong and reliable) then the LIFX bulbs are Very reliable and definitely the brightest and best colors of all bulbs. I also have Hue and TP-Link. 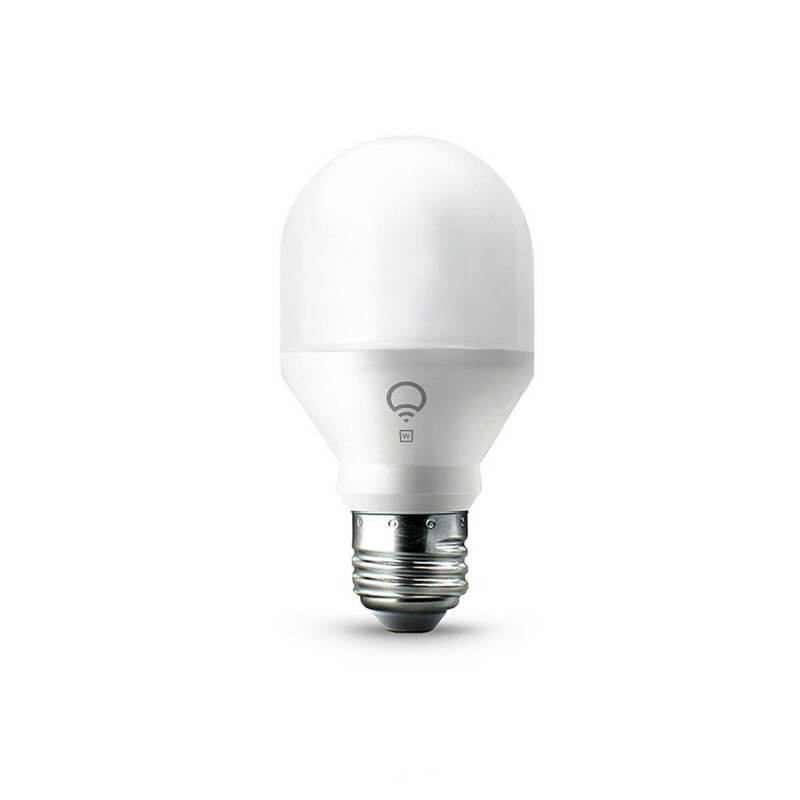 If you have a strong wifi connection, LIFX–by far–has the brightest and best bulbs. P.S. TP-Link does not use a hub and works very well, even on the previous just-okay wifi connection. I think your article is somewhat biased although useful. Both brands are good for what they are but for me reliabilty is #1, app support is #2 and accesories #3 and hue wins them all, so I’d go with them.